Minna Suoniemen Rule the World on yritys tutkia, millaista on olla 2010-luvun 15-vuotias. Taiteilija toteutti 13- ja 15-vuotiaiden siskosten kanssa videoita, joiden hahmot tytöt loivat itse. Teokset yhdistelevät väkivaltaa ja romantiikkaa, kauniita kauhuhahmoja ja Disney-prinsessoja. Maskeerattuna tytöt kurottavat jokapäiväisten sääntöjen ja odotusten tuolle puolen, kohti jotain merkityksellistä, kauhistuttavan kaunista ja palvottua. Maskin taakse jää tyttöjen epävarmuus ja jokapäiväinen elämä rajoituksineen, jota edeltävät sukupolvet vuodattivat salaisiin päiväkirjoihin. Minna Suoniemi (s.1972) on helsinkiläinen kuvataiteilija, joka työskentelee liikkuvan kuvan ja installaation keinoin. Häntä kiinnostavat häiriö, virhe ja toisin tekeminen normia purkavina mahdollisuuksina, joiden kautta eri tavoin luonnollistuneet rakenteet ja mallit voivat tulla näkyviin. So I’m 15… I feel so old, three more years and I’ll be 18.Three years is like nothing. Rule the World is an attempt to examine what it’s like to be 15 in the 2010s. 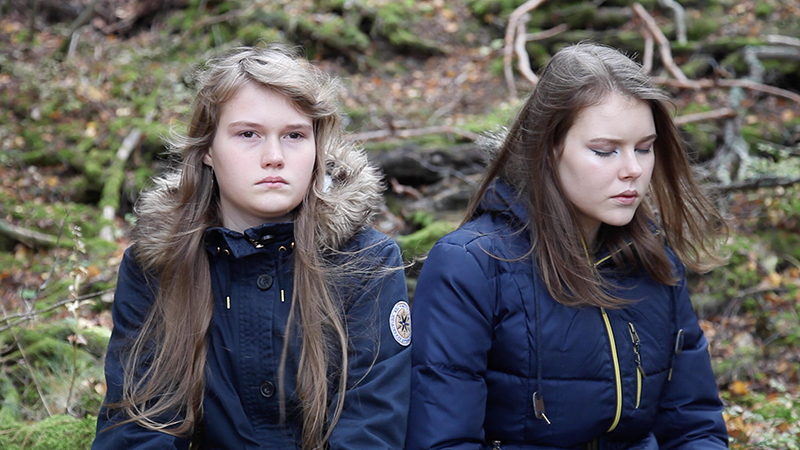 I worked together with 13- and 15-year-old sisters on three new video pieces Rule the World, Frozen and Ariel. 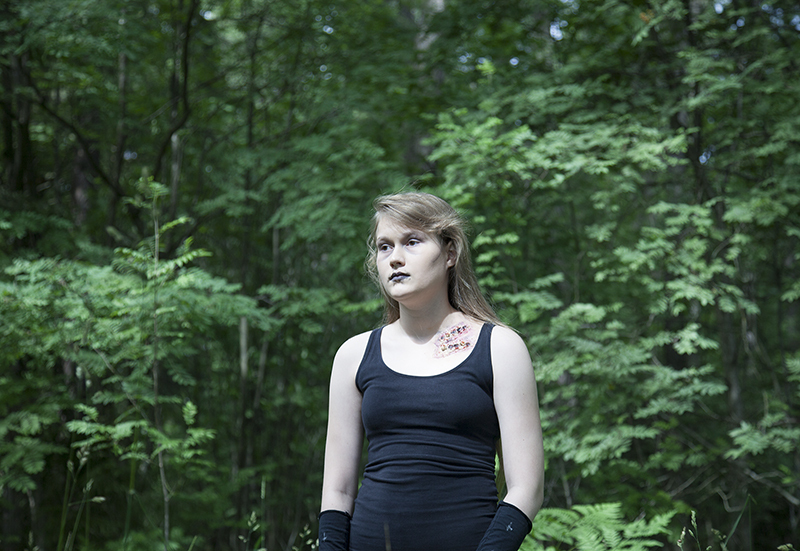 I was fascinated by the characters created with makeup and masks by the 15-year-old. They are violent and romantic, beautiful horror characters and Disney princesses. Makeup allows her to reach beyond the everyday rules and expectations to something meaningful, terrifyingly beautiful and admired. What remains behind the mask is the insecurity and daily life within boundaries, which previous generations recorded in private diaries. Instagram pictures show a confident, admired and somehow frightening young girl, who draws attention on social media and rules the world. It is a fairy tale, yet true, a self-made identity built and controlled by the 15-year-old. I’ve done this makeup thing for a year now. I want to say thanks to @mykie_ and @ellimacssfx. Because of their youtube videos I’ve found my way to do art. A year ago I was drawing on paper and I didn’t like it ‘cause I was bad at it. Now I’m only drawing on my face and I love it. And finally I can be proud and say #nofilter. Minna Suoniemi (b. 1972) is a Helsinki-based artist working with moving image and video installation. She’s interested in how disruption and failure can make normative structures and models visible and has worked on very loaded subjects such as gender roles, motherhood and power relations. Her works have been exhibited extensively in Finland and abroad, including EMMA, Kiasma, Moscow Museum of Modern Art and Preus Museum of Photography in Norway. Suoniemi is a member of the National Council for Audiovisual Art and works as a lecturer at the Aalto University Department of Art.